Don’t you just love it when an outfit comes together? When you buy all the bits and pieces because you love them individually, but don’t have a clue how to style them until you’re stood there with the wardrobe wide open hoping for some inspiration to hit you. That’s pretty much how this look came about. 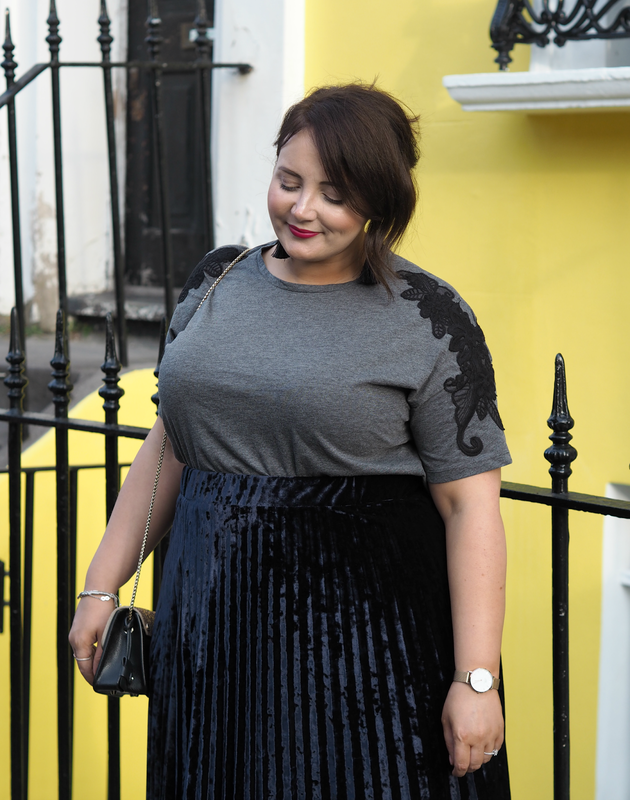 I’d had a lot of the accessories for a while, picked up the skirt on a whim while buying a sandwich in M&S (damn you and your fabulous food and fashion) and found the tee hanging in New Look while looking for some practical transitional jumpers. Nothing was intended to match, but it just kind of worked so I ran with it! That’s what fashion is all about: being creative, mixing and matching, and just seeing what suits you when you stand in front of that bedroom mirror. 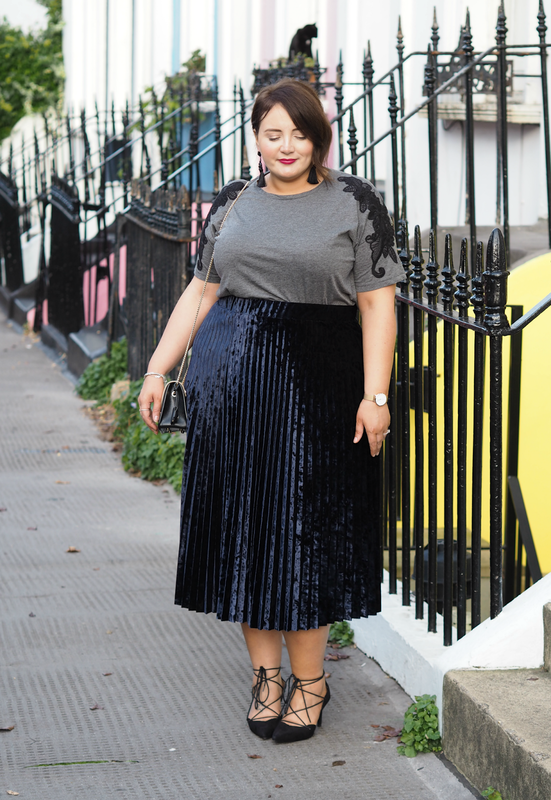 One of the key items I keep in my wardrobe throughout the year is a great pleated midi length skirt; there’s something so effortlessly elegant and timeless about a pleat hitting just below the knee, and it can easily be dressed down with a tee or jumper or dressed up with a touch of sparkle or texture. When I saw this one hanging up in M&S during their initial ‘new season’ stock display, I walked past it about five times before I could no longer resist. Navy is such a great shade for Autumn onwards, plus the velvet material keeps it evening appropriate and totally on-trend too. The cut is really flattering and the material so soft you just want to stroke it, making it one of the fave things hanging in my wardrobe right now. (I’ve just spotted it in red too, so I’m tempted to go back for more!) 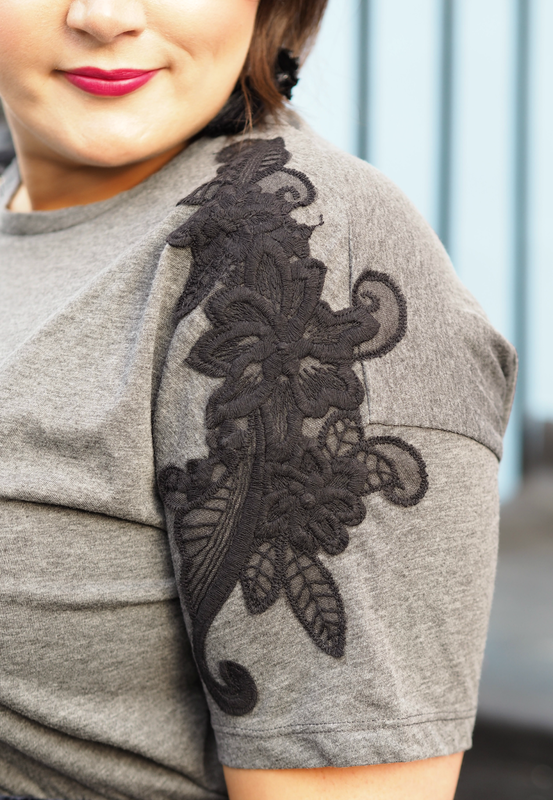 Paired with this simple embroidered grey tee from New Look is makes a subtle statement while being super comfy; the arm details really help to make this more than just another tee, bringing the accessories together one swirly design at a time! Back in my youth I used to wear heels practically every day; I’d strut into my uni lectures in four inch boots and think nothing of it, but years living in London and having to walk everywhere lead me to swap heels for flats on a pretty much permanent basis. Since then my feet seem to have developed a severe case of ‘heel fear’ and almost recoil at the thought of walking any further than door to car in three inches and above. I’ve got a tonne of heels that I have all the intentions of wearing, but realistically I embrace a pretty flat every time I can get away with it – which is why these beaut tie-ups from La Redoute have been sitting lingering in my closet for months. 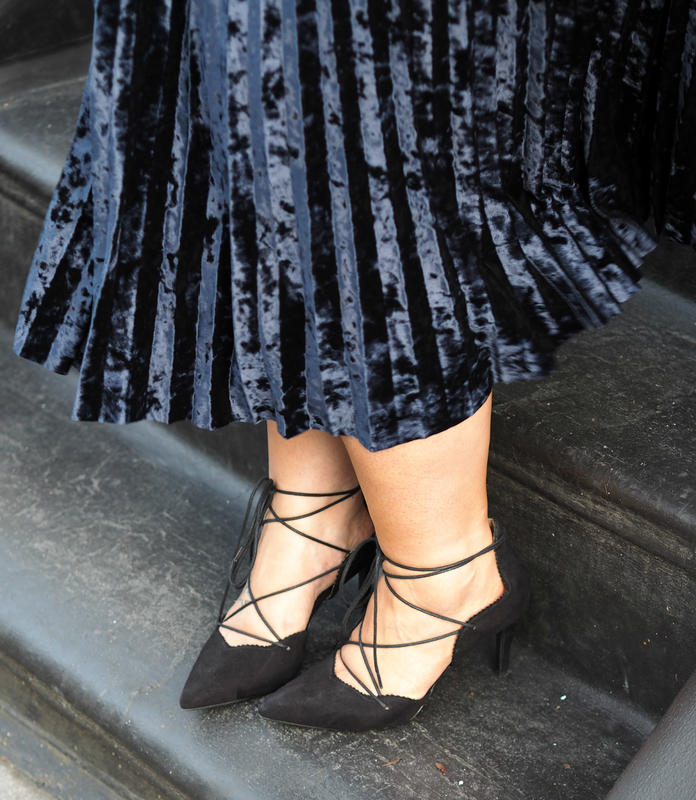 I adore the style of the laces and how they go with pretty much everything, so I bit the bullet and popped them on my tootsies to bring together the black elements of this effortlessly understated look. They’re definitely going to be my go-to for the winter party season. I hope you agree the burning balls of my feet were worth it! 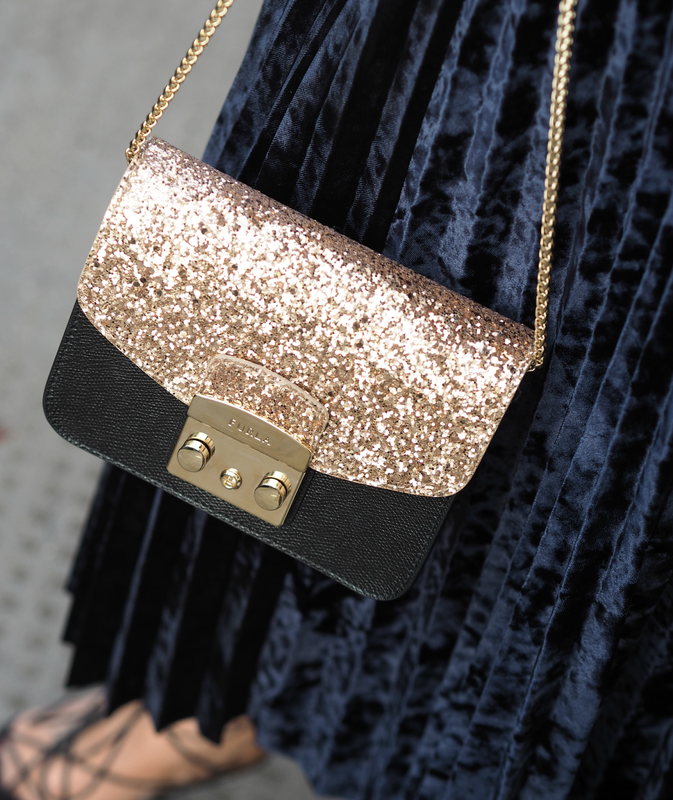 You may have seen this Furla bag before in another life (check out this post to see how it looks without glitter!) 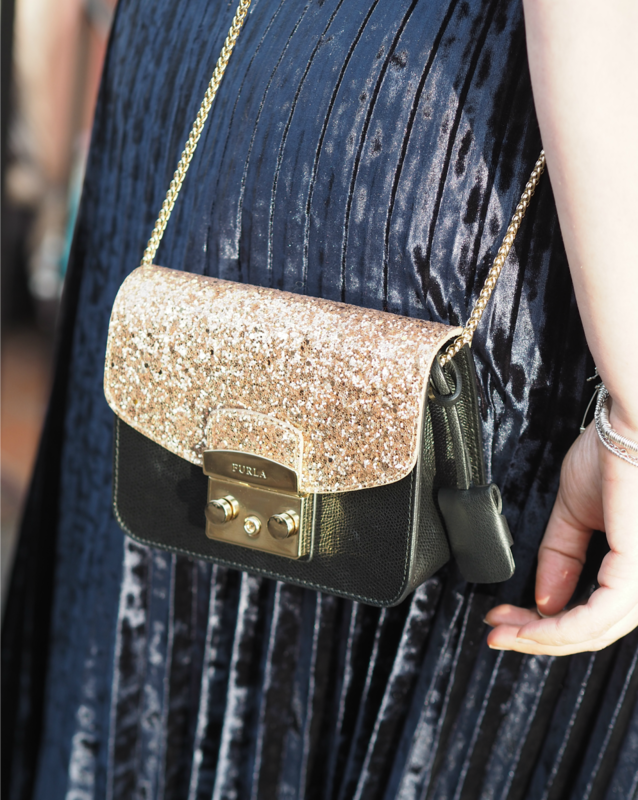 I still haven’t tired of its ability to reinvent itself with the flip of a popper – yep, the flap comes off and can be replaced with another, making it the ultimate multi-functional accessory. 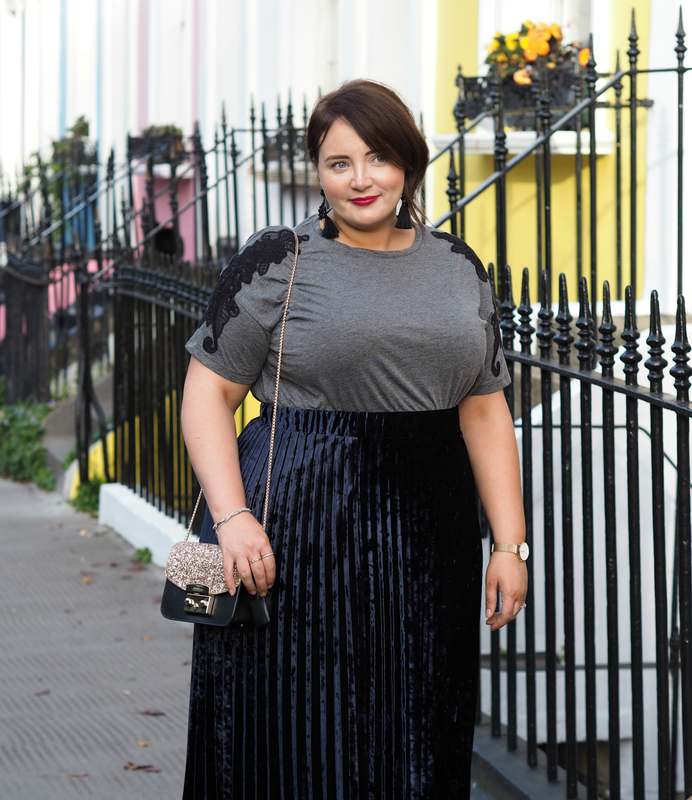 I’m not necessarily the most gold or glittery girl, but a sprinkling of it is sometimes just what I need to add a touch of sass or keep it evening appropriate; but that doesn’t mean you can’t wear glitter in the day! It’s done me well from weddings and parties, to days out and even traveling when you need a little cross-body to keep all your essentials close. Matched with a NARS berry lipstick, my fave black tassel earrings (are you bored of seeing them yet?) and my Daniel Wellington rose gold watch and I’m ready to hit the town. Who’s with me?! Next Post Oh Dior. 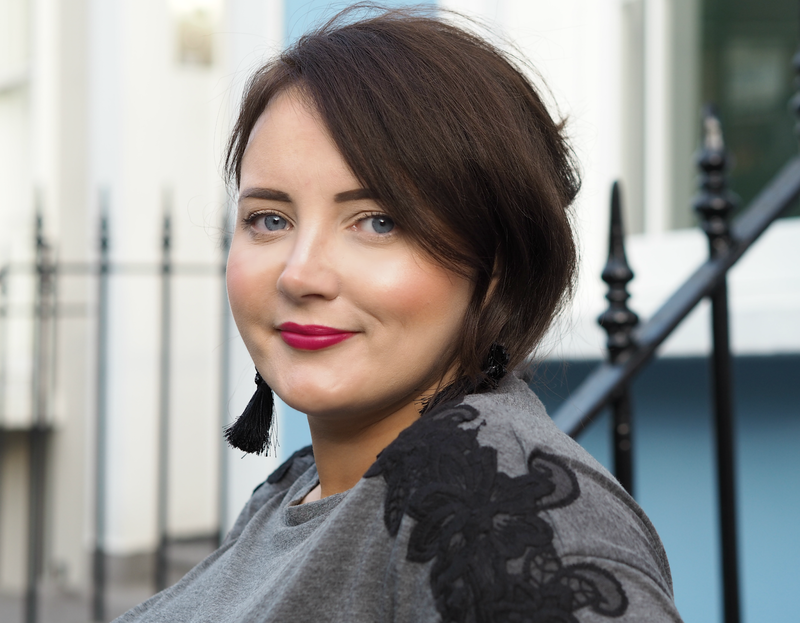 Why The Beauty Industry Needs To Have A Word With Itself & Start Treating Women With Respect. Thanks so much Pam! 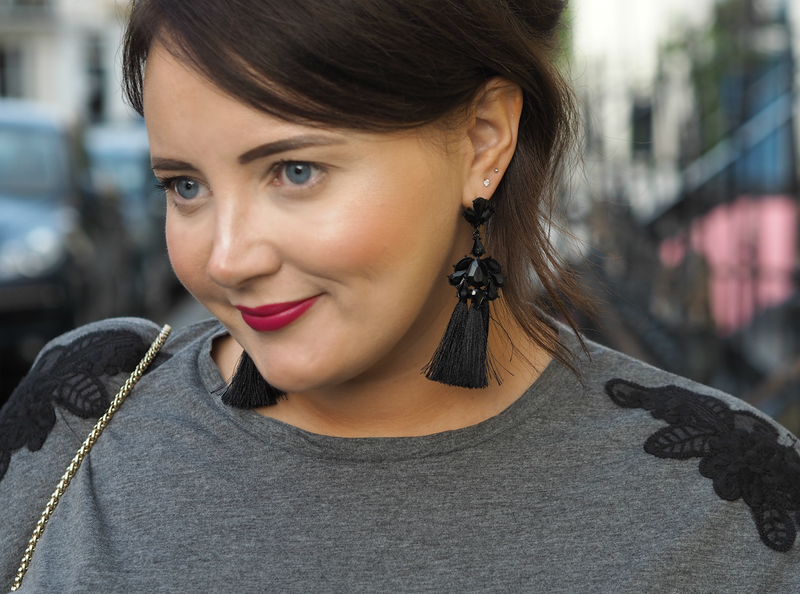 I'm a little bit in love with tassel earrings right now – they go with everything! You look so pretty in this outfit. I love the skirt, but I don't think I could pull it off as nicely as you. I'm sure you could! I think everyone can pull off a midi – it's just about finding the right top and accessories for you.